Almost everyone watches at least a little bit of television, right? Some people watch a whole lot. So, doesn’t it make sense to watch some in English? Getting hooked on [addicted to] a great TV show is an excellent way to improve your English. In fact, most of the great nonnative English speakers that I’ve met watch all television shows in the original language (English). People from Scandinavia and Holland are probably some of the best English speakers in the world–almost at the same level with native speakers from the UK, the U.S., Australia, etc. And if you ask someone from there why their English is so good, they will most likely tell you that it’s NOT from studying English a lot. It’s because the television shows in those countries are not dubbed [the audio changed to the local language]–they’re in English with subtitles in the local language. So people from countries like Sweden and Denmark are watching almost all their television in English from the time they are about five, which also gives them an opportunity to apply what they’re learning in their classes. Imagine how different the world would be if this were true everywhere. I sure wish I’d grown up with some television shows in Portuguese, Spanish, German, Catalan and French when I was a kid! Many of my students have told me that they are, “Not ready to watch television in English.” They say they need to study more and then they’ll start watching them in English. But this is just an excuse. You can start watching shows in English with subtitles in your native language, as long as you don’t let them distract you too much. The more that you do this, the more that you’ll find your English is improving, and eventually, you can graduate to watching shows in English with English subtitles and then with no subtitles(learn more about strategies for learning with TV here)! The best part about watching TV shows in English is that you’re learning real life English–the English that we speak daily. So you’ll be learning the language that we actually speak, not overly formal textbook English that you’ve probably learned in school (this isn’t bad to know, but you won’t get very far just studying out of a book). Plus, it’s a FUN and EASY habit to build. The advantage that you have as an English learner is that Hollywood is the world’s biggest producer of films and series–so there is so much that you can choose from! And your learning can become very entertaining. Actually, there might just be too much to choose from. So this article is going to talk about 10 popular, new series (started in the last few years), of all different genres, both British and American, that will capture your attention and keep you excited to improve your English every day. I will give you some vocabulary that will be useful when watching each show (learn good strategies for learning new vocabulary here). Find a show that sounds interesting, and I guarantee that you can acquire it and watch it with English subtitles. Treat this list like a reference guide. First read the level, theme and genre of each show, then read about the ones that interest you the most and watch their trailers. Once you’ve picked one or two shows, try to find them in the format that fits you best (with subtitles in your native language, with subtitles in English, or without subtitles). To enjoy these two shows you certainly need imagination. They don’t have strong plots, but that doesn’t mean that they’re not great. 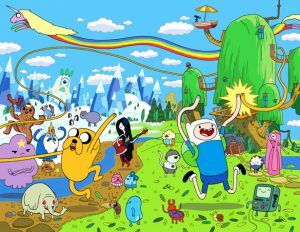 Adventure Time and Bravest Warriors were both created by Pendleton Ward–the former being shown on Cartoon Network and the latter only available on YouTube. Adventure Time has won several awards, including an Emmy. So, what makes Ward’s cartoons so great? The first couple times I saw Adventure Time, I didn’t like it. But after a few more times, it started to grow on me [I started to like it]. And now I’m hooked; I wouldn’t miss an episode! First of all, this may be a cartoon, but this is not a children’s show. It has many references that a child wouldn’t understand, and some episodes even cover complex topics disguised [hidden] under a comical adventure. Another great thing about these two shows is that they’re short–five to 10 minutes each. So you can watch an episode on your coffee break and improve your English! Adventure Time has even created its own culture and language. And while made up [created] slang like, “mathematical” or “tops blooby” might not be useful for your English vocabulary; it can make you a part of an entire community based on these two shows. Of course, you’re going to learn a lot of useful English from this show as well. Radical (adj) – used to describe something that is really awesome. You’ve probably heard of Breaking Bad, as it is one of the most popular movies of all time, and for good reason! 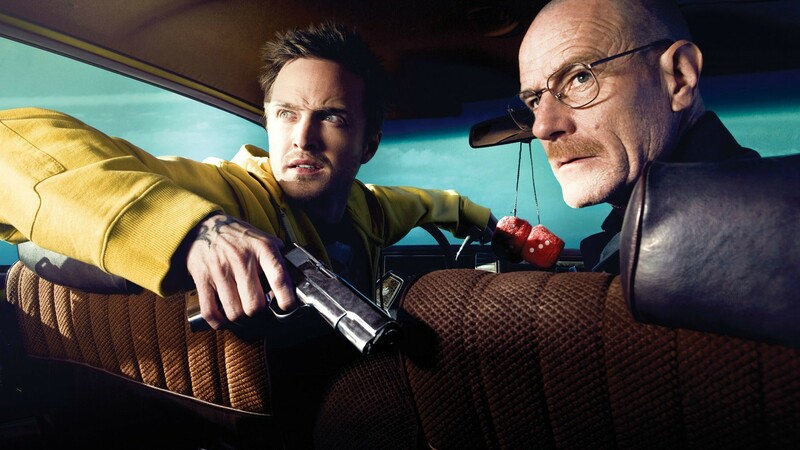 This show is about Walt, a high school chemistry teacher who is diagnosed with lung cancer. In order to provide for his family and pay for his medical bills, he decides to start developing and selling methamphetamine with a former student. It’s a one of a kind show. It’s taboo [a subject that is generally unacceptable to discuss] and has great, crazy plot twists [unexpected changes in the story] that make it impossible to stop watching. Meth (n) – nickname for methamphetamine, an illicit drug that is created through the mixing of different chemicals. It is deemed [believed to be] extremely dangerous and addictive, and is possibly one of the most problematic drugs in the United States today. Dexter is an exciting, intense drama that centers on a man named Dexter who, from a young age, when his mother was murdered, has had an urge to kill people. His adopted father, a police officer, teaches him that he must use this terrible urge for good–and only ever kill other murderers who have killed without any just cause. He also teaches Dexter that he must only kill people who he is absolutely sure are guilty, so Dexter often goes to great lengths to assure that his “victim” is a terrible criminal. Although one could say that Dexter is a “just killer” (that is, one who kills for the right reasons), this is certainly a dark show, and it may even have you watching with the lights on. It will keep you on the edge of your seat [full of excitement] to see what happens, as Dexter is another show full of great plot twists. 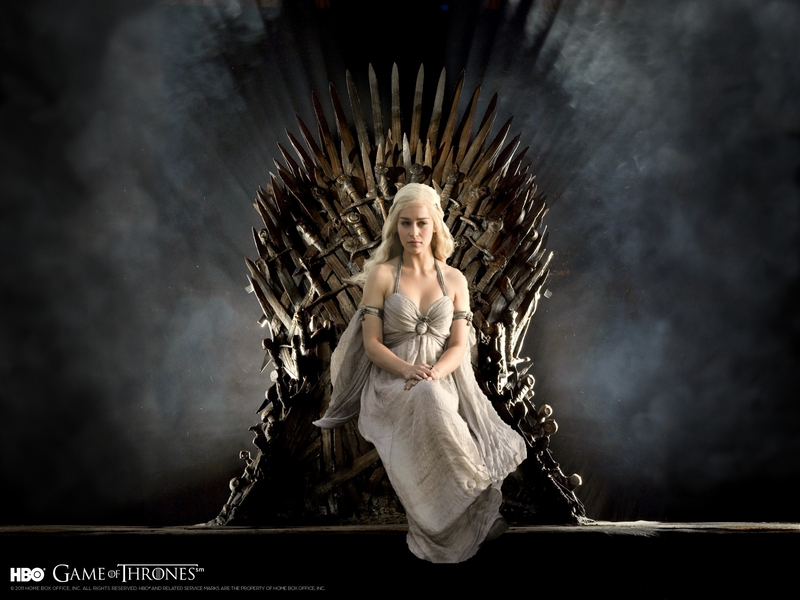 Game of Thrones is based a wonderful series of books called A Song of Ice and Fire by George R. R. Martin. This show (and the books) is great for anyone that likes action, passion, fantasy, history, and great plot twists [something sudden and unexpected]. Game of Thrones takes place in the land of Westeros in a medieval-like time. It follows the stories of many different fascinating characters and “the game,” that is, the fight for the throne–to be King or Queen of Westeros. Game of Thrones has an awesome plot–in my opinion one of the best of any book or show that’s been made–and it always leaves you wanting more (the episodes are each about an hour long, but you would never guess that!). If you have an active imagination and like movies/books like the Lord of the Rings then you’ll love Game of Thrones, but if you are more of a realist, then Game of Thrones might not be for you. Misfits is about several young people doing community service after committing various minor crimes. One day, there is a strange lightening storm. The main characters (the misfits) are all struck. When they wake up, all of the sudden, they each have different superpowers like invisibility and the ability to read minds. The series covers the different obstacles that they have to overcome after acquiring these powers. And with lots of intense action, you’re bound to want to keep watching! This series also gives you the opportunity to hear several different typical English accents. Storm (n)– when dark clouds gather and there is rain, lightening, snow, and/or hail. Superpower (n)– a power that allows one to do things which humans can’t naturally do (for example, fly, lift heavy objects, or turn invisible). 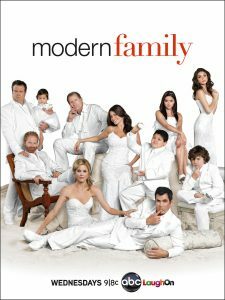 Modern Family is a hilarious show that makes a commentary on how the traditional American family has completely changed, and it shows what could perhaps be considered “typical” nowadays. 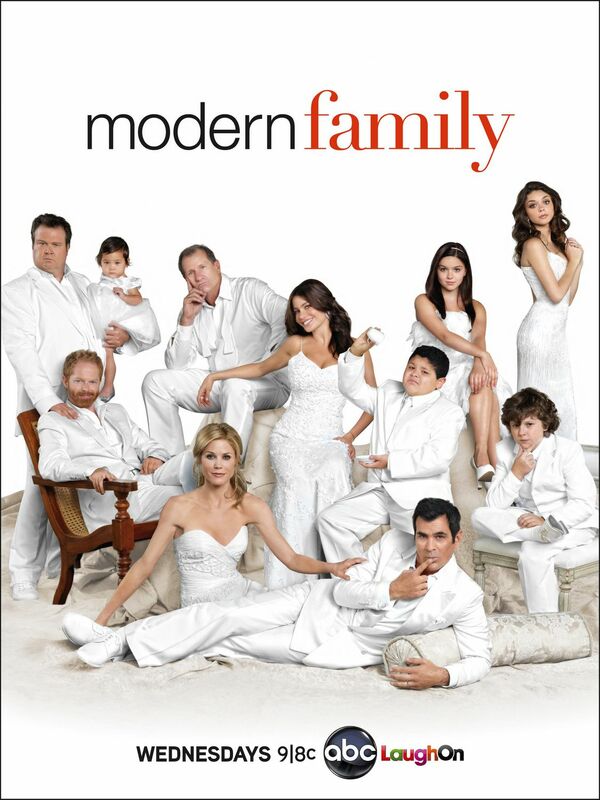 The Modern Family is composed of a grandfather, Jay Pritchett, who has a hot, young Colombian wife who still doesn’t quite fit in with American culture. She has a son who is a huge romantic, loves poetry, and wears suits and ties. It’s also about Jay’s son and daughter. His son is gay and has a partner and an adopted baby from Vietnam. His daughter is married to a man who is goofy [acts funny, silly] and a little crazy, and they have three children, each very different from the others. As you can see, it’s quite a complex and unique family, which is what makes the show so interesting and hilarious. Although this might not be completely typical, the show gives a good insight into American culture and how family life there has changed so much. Black sheep (n) – someone who doesn’t fit in with a group, the unique individual (especially within a family). This show is a modern day twist on the old Sherlock Holmes stories. Holmes is a consulting detective who uses modern technology to help him solve crimes with the help of his colleague Doctor John Watson, a former military doctor. Together, they work to solve London’s most complex crimes and defeat Holmes’ archnemesis, Jim Moriarty, a criminal mastermind. If you’re a fan of mysteries, and you enjoy shows that keep you guessing [you never know what is going to happen] then this is a great show for you to check out. This show requires you to dedicate a little more time (each episode is 90 minutes), but it’s definitely worth it. 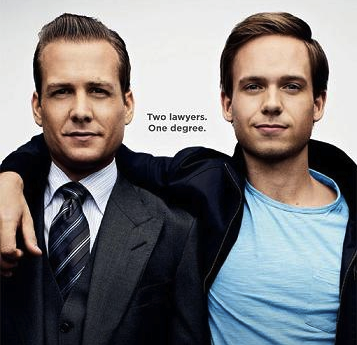 Suits is a show about one of the best lawyers in New York City–Harvey Specter. Now, a show about lawyers might sound boring–that’s certainly what I though–but it’s not. This is an excellent show. It’s funny, witty, and it always keeps you guessing. I would recommend this show to anyone who isn’t interested in predictable endings and who likes intelligent humor. And I would especially recommend this show for those who practice law (lawyers, judges, etc.) or business, who can benefit a lot from learning about law vocabulary. However, whether or not you are a lawyer, I believe you will understand and love this show. Plus, you can learn a lot about confidence, integrity, justice, and leadership–all of which are important for learning a new language. Touch is about Martin Bohm and his 11 year-old son, Jake. Martin’s wife died in the World Trade Center Buildings during the attacks in 2011. Jake has never spoken, and so most people think that he’s emotionally disturbed from losing his mom or that he has some mental problem, but the truth is that he’s a genius. Jake sees the world in numbers and the connection between everything, and after a while, his father begins to figure this out as Jake uses the numbers to communicate with Martin. He doesn’t understand very well what his son is trying to communicate to him, so he seeks out someone who knows better, a professor, who shows him that Jake sees a bigger picture, and is trying to help not just his father, but everyone. Throughout the show, Jake sends Martin on different “missions” where he encounters and helps strangers, changing occurrences all over the world. This show truly shows us how much our little actions can affect and change the lives of tons of other people. If you want to watch something that will really make you think about how your actions affect the world, then check out this show. Vikings takes place in Scandanavia in the 700’s. It’s centered around Ragnar Lodbrok, a famous Viking hero from Norse mythology, who has a plan to be the first person of his land to sail west to England and raid for riches. If you want a show similar to Game of Thrones, but more realistic, then check out Vikings. It’s full of action, intrigue, and exciting plot twists. It’s also a great way to learn a little bit about Norse history and mythology. You’re bound [assured] to get hooked. You may find Vikings an easier show to understand because they speak slowly. Note that many characters use a Scandinavian accent, but speak grammatically correct. Using television shows is an amazing, entertaining way to learn English the way that it’s actually spoken in real life. Experiment with some of these shows. Find one that really grabs you, and watch it from start to finish. Remember, you don’t need to understand it all, just try to get the big picture [what’s occurring]. You can really take your learning to the next level by trying some small exercises while you watch. Take it step by step. With each episode, your English will improve quickly, and this will spread to all areas of your learning (in class, when speaking, etc.). Also, if you like learning with TV shows, you should sign up to learn more about our popular new course, Fluent with Friends, and receive a FREE Ebook to help your vocabulary. Learn More. This is an amazing resource that I'll definitely use with my students! Thank you. In Croatia, we also watch TV in English with Croatian subtitles. I have watched all of these but my favourite is The Big Bang Theory. My students love it as well. Tv shows are really a great way to see native speakers in action. Idioms and usages occur in their natural context. Your classification turns them into a great resource. Thank you. Thanks so much! Really glad you enjoyed it. So useful that I was attracted ! Great stuff for learners of English. What about South Park? I really like to watch South Park to learn some very informal idioms and also swear words.lol They´re hilarious! That’s a great suggestion, Marcio! I tried to just do newer shows that people maybe haven’t heard of. But if anyone wants to learn swears, then South Park is definitely worth checking out. Game of Thrones is an American TV show. You should fix that. I already watched breaking bad, suits, and game of thrones and still watching ..i'm gaining convedince because the sorting of these shows as an intermidate and advanced level. On youtube you will find a great array of good, intelligent and thought-provoking tv shows produced by the BBC: Full episode series produced in the 70's, the 80's. Also, take time to read the comments posted by the viewers. Many of them are witty and well informed. they wiil help you develop critical thinking and enrich your vocabulary in English. It’s all true about TV shows being a great way to improve English, that’s what I always advise my students. Thank you for your amazing work. What LOLled me, though, was Game of Thrones and Vikings. You guys first say students learn real life English from TV shows, but how come Scandinavia in 700’s or a fantasy world is relevant to this? What’s so real life in vocabulary like “slave”, “imp” and “loot” anyway? I’m not saying those shows are bad for learning English, there’s just a tiny contradiction. I would also add “the good wife” to your list. Hey Ivan, you’re open to your opinion, but it’s more about them being shows that would captivate certain learners’ interest (which might include history or fantasy) than actually about the type of English used in them. They are educational and useful no matter what genre as the most important thing is making learning fun :). Also, the vocabulary given is just some examples of things learners might find difficult to understand in the show. This is definitely a well written article, good job on that. I came here to find out what you’d say about the level of English spoken in Suits. And I’m quite shocked that you think it’s “upper intermediate”, while you think it’s advanced in GoT. In suits there are many difficult business terms which are being used throughout the episodes, furthermore most of the conversations being held within the show are spoken at a very fast pace. I’m not a native myself, but I’ve passed my “Cambridge advanced English” exam which is at C1/2 level and I have no difficulty whatsoever watching GoT without English subtitles, but it’s a whole different story with Suits. I still find myself troubling over some words and phrases being used in it. Hey Tim. Thanks for your feedback! I can totally see where you’re coming from, and am happy to share my opinion. 1) Most of our audience learns American English, including my own students, who tend to find that GoT just goes over their head if they don’t have subtitles. If you learned British English I could see it being the other way around. 2) GoT uses (or at least tries to use) a lot of medieval-esque English, including a lot of vocabulary that native speakers never use nowadays. This is probably the defining factor of why I rated it advanced and not upper-intermediate. In summary, I think that it’s going to depend a lot on the student and their English background. The ratings of these two are fairly comparable, so in many cases it’s probably based on opinion. I think it’s important to challenge ourselves when learning another language, so I would push students to experiment and push themselves. Last, I apologize for so much delay. I’ve just now seen this. What are the ratings for these? Swearing really turns off my adult students. Also there’s a PBS sci-fi series called FutureStates , 25 minutes each, free on the PBS site. Or Shorter versions of the same eps on youtube. Sounds interesting. It depends, most of these don’t have much swearing. But if that’s the case I would NOT recommend Game of Thrones, Misfits, Dexter or Breaking Bad. If they are sensitive to violence, Vikings might also be inappropriate. I’ve watched them all but for 2. My fav. among these is Vikings. Absolutely brilliant story and characters. Entertaining without all that fantasy thing. Story always gets to the main point quickly. Doesn’t keep you waiting with too many side-stories. Just pick one and start watching. If your level is low, start with a comedy. Like Modern Family, How I met your mother or The Big Bang Theory. If you come across sth useful in dialogues, write it down at least in a text file. PS: I’m not a Game of Throne hater! I watch it. It’s great but I’m not very fond of all that fantasy! But good thing is the language is advanced and the accents often standard. Once you got more advanced, watch something like House of Cards.